LEADING marine search and rescue experts from the islands of Ireland and Britain will put on an exciting display of their life-saving skills next weekend in Moville-Greencastle. 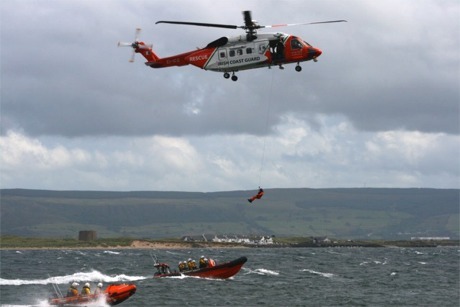 The shores of Lough Foyle will welcome the Navy and some of the country's top rescue crews for the annual Irish Marine Search and Rescue Demo (IMSARC) on Saturday, July 16. Greencastle Coast Guard will co-ordinate a busy, day-long schedule of events involving the Irish Coast Guard helicopter, the Naval ship LÉ Orla and the Air Corps Casa aircraft. 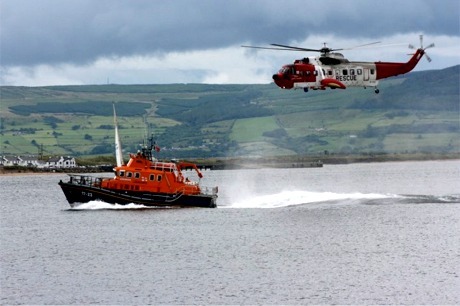 Lough Foyle to host top marine rescue crews. A good crowd is expected and spectators can expect to see both land and sea operations including winching and shoreline techniques. Donegal-based volunteer Coast Guard units and the crew of Buncrana RNLI's new Shannon-class lifeboat 'Derek Bullivant' will also demonstrate their skills. Meanwhile, Bord Iascaigh Mhara; the UK Maritime Coastguard Agency, Irish Water Safety, Mountain Rescue Ireland, Civil Defence and Foyle Rescue will also take part. The event will commence at 11am with a mud rescue demonstration by nearby members of the Maritime Coast Guard Agency. There will also be a demonstration of drone technology. Water-based events involving the Coast Guard helicopter, the LÉ Orla and the Air Corps Casa as well as other displays will commence at 1.30pm.